A tipster sent us this example of sloppy, sloppy Photoshop, courtesy of American Apparel. 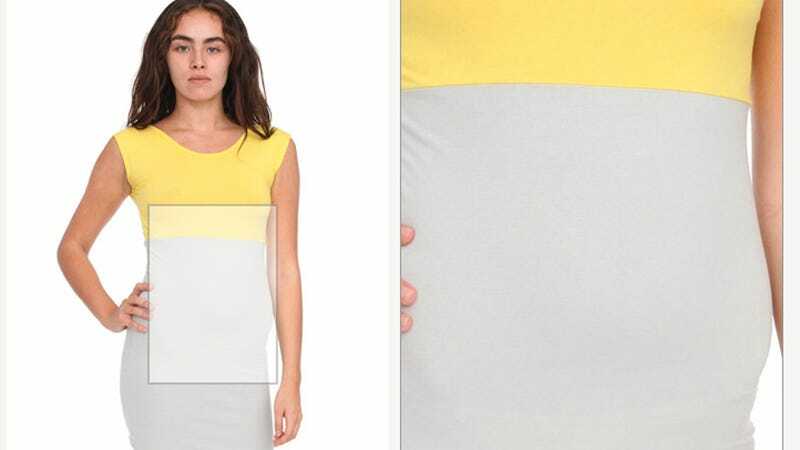 The Cotton Spandex Two-Tone Fitted Mini Dress is modeled by a few different women, one of whom — wearing the sunshine/silver color combination — has been awkwardly altered in Photoshop. As you can see in this detail (click to enlarge), someone tried to cover something up, and airbrushed a circle of gray over the model's tummy. The gray color doesn't exactly match the dress, however, so there's a faint line that appears where the dress ends and Photoshop begins. Were there some fabric wrinkles that needed smoothing? Was an "outie" belly button too distracting? Did this lady have a gaping wound from an alien birth? We'll never know. The end result? This poor woman now has a weird growth rising from her side. And she doesn't look happy about it.